"My mother worked hard to instill faith in me. She sent me to catechism classes. She bought me nun paper dolls, as though the meager fun of swapping a Carmelite wimple for a Benedictine chest bib might inspire a taste for devotion. Most memorably, she read the Bible to me. Every night at bedtime, she'd plow through a chapter or two, handing over the book at appropriate moments to show me the color reproductions of parables and miracles: The crumbling walls of Jericho. Jesus walking atop stormy seas with palms upturned. The raising of Lazarus--depicted in my mother's Bible as a sort of Boris Karloff knock-off, wrapped in mummy's rags and rising stiffly from the waist. I could not believe these things had happened, because another god, the god who wore lab glasses and knew how to use a slide rule, wanted to know how, scientifically speaking, these things could be possible. Faith did not take, because Science kept putting it on the spot. Did the horns make the walls fall down, or did there happen to be an earthquake while the priests were trumpeting? Was it possible Jesus was making use of an offshore atoll, the tops of which frequently lie just inches below the water's surface? Was Lazarus a simple case of premature entombment? I wasn't saying these things didn't happen. I was just saying I'd feel better with some proof. . . ."
Allison DuBois is one of four mediums taking part in a research project called the Asking Questions Study. I love this study, because it addresses one of my main beefs with medium-brokered encounters with the dead. Dead people never seem to address the obvious--the things you'd think they'd be bursting to talk about, and the things all of us not-yet-dead are madly curious about. Such as: Hey, where are you now? What do you do all day? What's it feel like being dead? Can you see me? Even when I'm on the toilet? Would you cut that out? If the dead come through at all, they come through in cryptic little impressions: a stout woman with grey hair, a small black dog, the date May 23. It's a maddening way to communicate. Schwartz and his mediums would reply that that's the best the dead can manage, that they can't speak sentences into the medium's head. Impressions come through, and that's all. Julie Beischel, the researcher behind the Asking Questions Study, wondered whether perhaps it was the case that the dead never give this kind of information because no one ever bothered to ask them. She assembled a list of thirty-two questions about the afterlife, which are being posed to two discarnates, via four mediums. (Each medium takes a turn with each of the two dead folks.) Beischel hasn't analyzed the data at this point, but she gave me printouts of the answers she has collected. With both discarnates, the answers to a given question usually differed with each different medium. "Do you eat?" for example, garnered an even split of yesses and nos. I asked Beischel how she interpreted this. 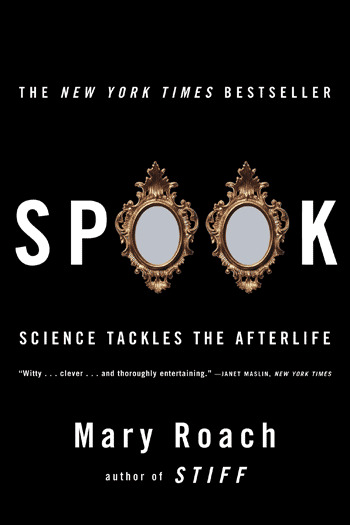 She said, very straightforwardly, as is her manner: "My interpretation is that the mediums are just guessing, or the answer is biased by the medium's own ideas of what the afterlife is like, or the questions don't have enough emotional interest for the discarnate to give a strong answer." Which more or less covers all the bases. In case the answers are in fact coming from the Beyond, I've culled some highlights for you, from various mediums. Q: What do you do every day? A: She's showing herself at the table eating. Q: What type of "body" do you have? Q: How is the weather? A: It's Florida without the humidity. A: Yes. She whips out a xylophone and goes, bum, bum, bum bum bum. And I also get The Carpenters. A: Yeah, ... but they've got their own clique going. They've got their own little deal going on. Q: Do you engage in sexual behavior? A: I don't know if like she can and she chooses not to or what the deal is, but it's like, no, not really. To the formal study data, I feel I must add one last statement about the afterlife, passed along to me by Allison DuBois, who received it from an unnamed discarnate during a private sitting: 'I can wear pleated pants now.'" "The traffic jam has dissolved, leaving our driver free to proceed in the manner he enjoys. This entails driving as fast as possible until the rear end of the car in front is practically in his mouth, then laying on the horn until the car pulls into the other lane. If the other car won't move over, he veers into the path of oncoming traffic - for sheer drama, an approaching semi truck is best - and then back, at the last possible instant. Livestock and crater-sized potholes materialize out of nowhere, prompting sudden James-Bond style swervings and brakings. It's like living inside a video game. "Why doesn't he just get into the fast lane and stay there!?" "There isn't a fast lane, as such," says Dr. Rawat. He gazes calmly out his window, as goats and a billboard for RELAXO footwear flash past. "The lanes are both the same. Whoever is slower, pulls over." His speaks in a neutral, narrative tone, as though describing a safe and civilized code of the road. Aggressive honking and light-flashing is considered good manners: You're simply alerting the driver ahead of your presence. (Rear view mirrors are apparently for checking your hairdo. Likewise, the driver side mirror currently registers a clear and unobstructed view of the dashboard.) Exhortations to BLOW HORN PLEASE and USE DIPPER are painted on the backs of most trucks, so that even the most laid-back driver goes along honking and flashing his lights like his team has just won the World Cup. I am finding it hard to relaxo. In India, everywhere you look, someone is calmly comporting themselves in a manner that we in the States would consider a terrible risk, a beseeching of death with signal flares and megaphone. Women in saris perch sidesaddle, unhelmeted, on the backs of freeway-fast Vespas. Bicyclists weave through clots of city traffic, breathing leaded diesel fumes. Passengers sit atop truck cabs and hang off the sides like those acrobat troupes that pile onto a single bicycle. Trucks overladen with bulbous muffin-top loads threaten to topple and bury nearby motorists under illegal tonnages of cauliflower and potatoes. (Accident Prone Area, the signs say, as though the area itself were somehow responsible for the carnage.) People don't seem to approach life with the same terrified, risk-aversive tenacity that we do. I'm beginning to understand why, religious doctrine aside, the concept of reincarnation might be so popular here. Rural India seems like a place where life is taken away too easily -- accidents, childhood diseases, poverty, pollution, murder. If you'll be back for another go, why get too worked up about the leaving? A bus blasts its horn and bullies us onto the shoulder. "&*@##!!" Dr. Rawat winces. "Meddy! Just don't look out that side!'" "The National Forest Service has a fine and terribly dark sense of humor, or possibly they have none at all. For somebody, perhaps an entire committee, saw fit to erect a large wooden sign near the site where fourteen emigrants bound for California were eaten by other emigrants bound for California when they became trapped by the savage snows of 1846 and starved. The sign reads: DONNER CAMP PICNIC GROUND. I got here on a tour bus chartered by Dave Oester and Sharon Gill, founders of the International Ghost Hunters Society. IGHS, one of the world's largest (14,000 members in 78 countries) amateur paranormal investigation groups, sponsors ghost-hunting trips to famously and not-so-famously haunted sites. By and large, we look like any other tour group: The shorts, the flappy-sleeved tees, the marshmallow sneakers. We have cameras, we have camcorders. Unlike most visitors here today, we also have tape recorders. I am facing a pine tree, several feet from a raised wooden walkway that guides visitors through the site. I hold my tape recorder out in front of me, as though perhaps the tree were about to say something quotable. The other members of my group are scattered pell-mell in the fields and thickets, all holding out tape recorders. It's like a tornado touched down in the middle of a press conference. A couple and their dogs approach on the walkway. "Are you taping bird calls?" I answer yes, for two reasons. First, because, well, literally, we are. And because I feel silly saying, "We are wanting to tape the spirit voices of the Donner Party." Thousands of Americans and Europeans believe that tape recorders can capture the voices of people whose vocal cords long ago decomposed. They refer to these utterances as EVP: electronic voice phenomena. You can't hear the voices while you're recording; they show up mysteriously when the tape is replayed. If you do a web search on the initials EVP, you'll find dozens of sites with hundreds of audio files of these recordings. Though some sound like clearly articulated words or whispers, many are garbled and echoey and mechanical-sounding. It is hard to imagine them coming from dead souls without significantly altering one's image of the hereafter. Heaven is supposed to have clouds and bolts of white cloth and other excellent sound-absorbing materials. The heaven of these voices sounds like an airship hanger. They're very odd." Lewis E. Hollander, Jr., is a sheep rancher in Bend, Oregon. Sometime in 2000, Hollander became the second man in history to set up a soul-weighing operation in his barn. He rigged a seven-by-three-foot platform to a Toledo model 8132 electronic digital indicator, a quartet of load cells, and a computer. His subjects were eight sheep, three lambs, and a goat, all of which were sedated and then euthanized, and all of which, he assures us, were headed that direction anyway. The animals were wrapped in plastic to, as he put it, contain any voiding. This was important because 1) voided material might drip off the weighing surface, creating a spurious weight loss, and 2) you try getting sheep urine out of your load cells. Here is the odd thing. All the sheep Hollander tested showed a temporary weight gain at death--most between 30 and 200 grams. One notable ewe put on 780 grams: nearly two pounds. The gain lasted from one to six seconds and then it disappeared. The three lambs, did not, however, gain any weight, and neither did the goat. I called Hollander and asked him what he thought this meant. "I haven't the faintest idea," he said sensibly. He acknowledged the possibility that the weight gain was an artifact of his equipment malfunctioning, but his instinct was that the blip was real. "If you were there at the time, you could see the whole scenario coming together and you could see this moment... It's weird. There was something happening there.'"